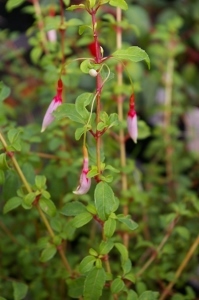 Joy Creek Photo Archive (c) all rights reserved We are grateful to our friend Linda Rectinus who gave us our first specimen of this graceful Fuchsia. The small flowers dangle from the underside of wand-like stems. Individual flowers have red tubes, soft pink sepals and red-violet corollas. Their long red stamens are exerted in a showy fashion. The mid-green leaves are small and somewhat rounded with light serration along their edges. One additional point of beauty is the red stain on the leaf petioles and on the stem where they attach. Summer to autumn. 3-4 ft. x 3-4 ft.